Tory leader Michael Howard has accused Tony Blair of squandering the chance to lead efforts against climate change. In a speech to an environment forum, Mr Howard described climate change as "one of mankind's greatest challenges". He said it was very disappointing that Tony Blair had not succeeded in persuading US President George Bush that the issue should not be shirked. In a speech on Tuesday, Mr Blair is expected to say other countries need to do more to cut pollution. Mr Howard called for a new drive to persuade America to sign up to the Kyoto accord and suggested he was better able to fulfil that ambition. He pointed to the way he, as environment secretary in John Major's government, had persuaded President Bush's father to sign up to the forerunner of the Kyoto agreement. Just as on the war on terror, nobody could opt out of the fight against global warming, he said. "America generates a quarter of the world's greenhouse gas emissions, yet it has only four per cent of the world's population," he said. "Their involvement is essential if we are to have effective action. It can be done." Mr Howard urged a new focus on energy efficiency, which he called the "Cinderella" of the debate. At least two-thirds of Britain's housing stock had yet to benefit from any efficiency measures at all. 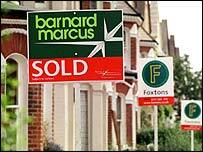 He suggested there could be a cut in stamp duty on energy efficient homes. Mr Howard attacked the government for "betting the farm" on onshore wind energy and putting renewable energy on a collision course with local residents' opinion. Offshore wind power, biomass plans, solar, wave and tidal power were being neglected, with Britain losing ground on developing such technology. The Tory leader committed his party to phasing out the use of hydroflurocarbons (HFCs), which are used in fridges and air-conditioning, between 2008 and 2014. Creating a market for buying and selling their agreed allowances of greenhouse gas emissions could also give businesses an incentive to reduce emissions, he argued. He also pushed for an expansion of cars using new biofuels. And there should be faster work on whether to include aviation in a European and eventually global emissions trading scheme. Mr Howard argued attacking Labour tax rises did not Tories could not change taxes to encourage greener activity without raising overall tax levels. Mr Howard concluded: "Promoting greener behaviour need not hold back economic growth or restrict choice. "But the longer we delay action, the harder it will be to achieve that outcome." Mr Howard did not mention nuclear energy in his speech. Asked if the government should expand Britain's nuclear plants, he said: "Nuclear power is expensive and there are still questions that need to be answered on how we deal with nuclear waste." There should be a comprehensive assessment of Britain's energy needs, possible alternative sources of supply and whether nuclear power was needed, he said. Green Alliance director Guy Thompson welcomed Mr Howard's focus on climate change but said the Tories had to be more explicit about detailed policies. Friends of the Earth director Tony Juniper called the speech "some of the most sensible comments on the environment from a Conservative leader for many years". He said Mr Howard must now show what steps he would take to cut emissions and stand up to "powerful lobbying from industry and the motoring lobby". Liberal Democrat environment spokesman Norman Baker said Mr Howard was really a "toxic Tory" who in government had given water companies an amnesty to water companies polluting rivers and tried to repeal European environmental legislation. 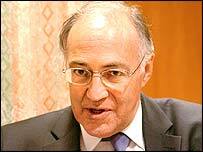 "Michael Howard is desperately attempting to jump on the green bandwagon, and has missed his footing," said Mr Baker. "Howard claims carbon dioxide emissions have risen under Labour"